A gold bangle bracelet is a truly essential accessory that you can wear to the office, that cozy Sunday brunch, that fabulous five-star restaurant or to that upcoming special event. With the John S. Brana Matte Finished Hammered Gold Cuff Bracelet, you get the beautiful look of a yellow gold bangle without having to pay a small fortune for 24-karat gold. This Red Brass Nu Gold bracelet captures all of the rich color of traditional gold and has been hammered to give it a distinctive texture then brushed by hand to give it a beautiful matte finish. 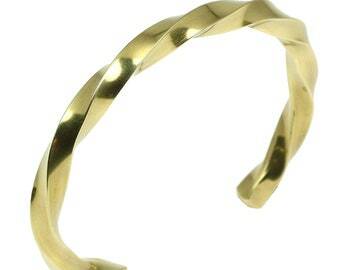 This bracelet is offered in sizes ranging from 6-1/2 to 8 inches in circumference to suit women of all wrist sizes. Fully handcrafted, the bracelet is easy to slip on and off, thanks to its 3/4-inch opening, and it measures 1-3/4 inches in width to make a bold statement without being too bulky. Store your brass jewelry in a re-sealable plastic bag to prevent air from tarnishing it when you aren't wearing it. Make sure your jewelry is clean and moisture-free before storing. Body chemistry, sweat, soaps, lotions, makeup, sunscreen, or bathing/swimming will accelerate oxidation/patina and cause skin to turn green, which is not harmful to one’s health. 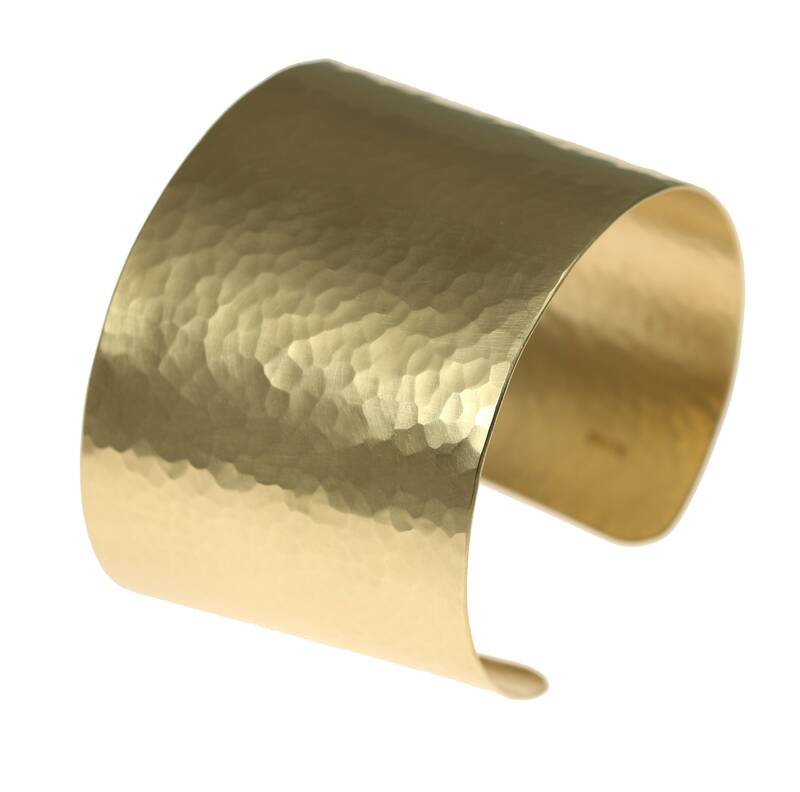 Un-coated, the John S. Brana Hammered Gold Cuff Bracelet's luster and shine can easily be cleaned and maintained with a mild Brass or Copper metal cleaner (test first). Apply with a soft toothbrush or cloth, gently scrub, then rinse thoroughly with warm water, and dry/buff with a soft cloth.